Everyday I make dinner for 40-50 people, ranging in age from infants just trying solid foods to women in their early 30’s. Breakfast for dinner night is a very popular institution here, one I’m not really a fan of, since it’s usually devoid of all things healthy (pancakes, bacon, etc). Instead of grumbling about breakfast for dinner, this morning I decided to make a few breakfast items I felt a little better about serving up to our ladies and kiddos. This cake is the first, and would be a great make-ahead breakfast for people who feel too busy to make healthy breakfast choices. It keeps you full for hours and can easily be made vegan or with gluten free oats. Preheat oven to 350 degrees. Grease a 9×13″ baking pan and set aside. Mix thoroughly everything but the oats, cranberries and almonds. Then add those things. Pour mixture into your greased pan, and allow it so sit in the fridge for at least and hour to let the oats soak up some liquid. Bake mixture for 40 minutes in the greased pan. It should be easy to reheat pieces in the toaster oven for weekday breakfasts, and I bet it’d be great topped with a little yogurt if you’re into that sort of thing. 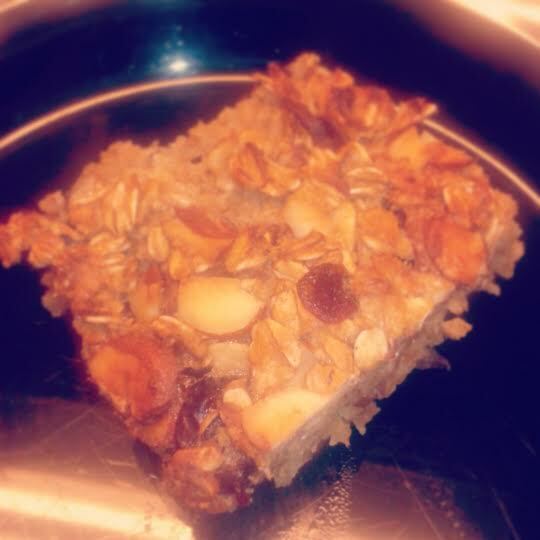 This entry was posted on January 28, 2014 by Chef Jill in Recipes and tagged Breakfast, Gluten free, Whole Grain.